You say tomato, I say...trade war? A deep divide is brewing among American farmers as President Trump's trade team renegotiates NAFTA, the three-nation trade deal with Canada and Mexico. A group of mostly southeastern U.S. farmers want a major change to NAFTA, which they say has hurt them. But a separate coalition of farmers and industry leaders are vehemently opposed to the agriculture overhaul, saying it's bad for business. 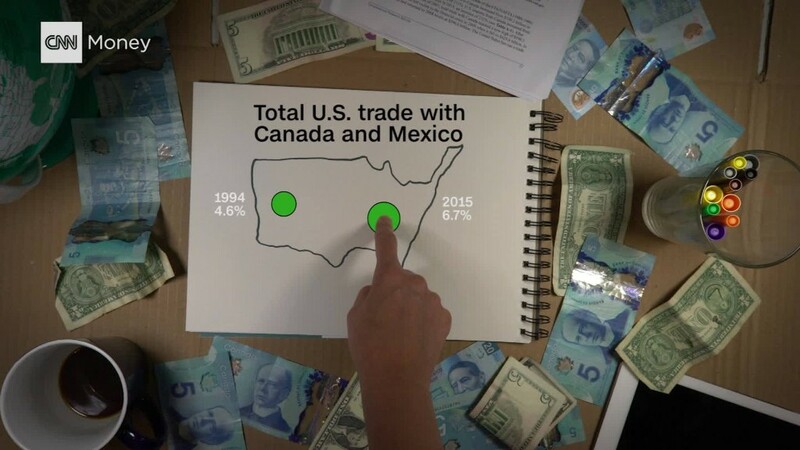 The thorny debate illustrates how NAFTA's winners and losers have been defined along fine lines, from one farm to another. The key issue for some U.S. farmers is proving whether Mexican or Canadian growers are selling tomatoes, blueberries, avocados and other products at a price well below the average price tag. It's a practice known as "dumping." Under the current law, farmers have to prove that a foreign product has been sold at an unfairly low price for three years and that it has hurt the industry nationwide -- not just in a particular state or region. The big proposed change in the NAFTA renegotiation would mean that farmers would only need to prove foreign growers were dumping for a few months, or one season. They would also only need to prove that their local state or region was hurt, not the entire nationwide industry. The change would lower the bar significantly for the U.S. to slap tariffs on imported food. That could ultimately make some fruits and vegetables more expensive at the supermarket or drive up menu prices at restaurants. In its list of objectives, the Trump administration indicated support for the southern farmers, who directly compete with Mexican growers because they harvest many of the same crops and grow during the same time of year. Supporters say the change is long overdue as Mexican farmers have flooded the U.S. market with cheap fruits and veggies. That's a result of Mexican government subsidies, cheap labor and ramped up production, they say. "Our industry is in dire need of government help," Reggie Brown, executive vice president of the Florida Tomato Exchange, a collective of tomato farmers, told the House Agricultural Committee at a hearing on July 26. "U.S. fresh tomato production is in serious decline." Imports of Mexican tomatoes to the U.S. have nearly tripled since 2000. Meanwhile, U.S. production has fallen 40% over the same time, according to Brown's report to Congress, citing government data. Critics of the proposed change say it opens up U.S. companies to tariffs and lawsuits. After all, the rules would go both ways: Mexican and Canadian farmers could use tariffs if a U.S. export, such as corn, was being dumped in their country. Mexican corn farmers lost out badly from NAFTA, with hundreds of thousands of farmers forced to abandon their land when they were unable to compete with U.S. corn farmers shipping to Mexico. Opponents of the rule change also argue that fresh produce sometimes has to be sold at a low price. Put simply, some years there are just more blueberries than others. "If all of the sudden we have a flush of blueberries because of the weather...we really have two choices: we can either throw our product away, which we don't want to do, or we can lower the price," says Soren Bjorn, president of Driscoll's, one of the world's largest berry companies. "If I sell it at this lower price, do I run the risk that I trigger this provision and somebody might sue me?" Driscoll's, based in California, symbolizes how integrated trade is in North America. It sells berries across the region which are grown in the U.S., Mexico, Canada and South America. Related: Why hasn't Trump used his 'sledgehammer' on trade? If the rule change passes, Driscoll's could conceivably get hit by tariffs from all three countries. Bjorn argues that almost all types of fresh produce have good and bad seasons where a lot or a little is grown. "It's very risky for U.S. producers to agree to this," adds Bjorn, who also helps lead the Produce Coalition for NAFTA, an advocacy group made up of U.S. and Canadian firms. He isn't alone. Seven advocacy groups, including the National Restaurant Association and National Retail Federation, signed a letter to the administration, urging it to not make such a drastic change. They say it'll cost jobs and force price hikes. However, Trump's trade officials are siding with the southern farmers, though it's unclear if the issue has reached the negotiating table yet. The office of the U.S. Trade Representative didn't respond to a request for comment. NAFTA talks began in August and are slated to continue until at least December. Trump says if the U.S. can't reach a better deal for American workers, he'll withdraw from NAFTA. Free trade advocates say it's unlikely he'll pull out -- but never say never. "I doubt he'll withdraw...many industries and groups have become accustomed to it," former U.S. Senator Max Baucus, who recently penned an Op-Ed on trade, told CNNMoney. " But you never know, he's unpredictable."